What does it feel like to meet a challenge and succeed? That was the question asked by thirty Year 10 students when they visited Aintree Army Barracks. Thanks to the professionalism and encouragement of Jason McKinney and his esteemed colleagues, our students saved flooding villages and gained an insight into the logistics and consideration needed in the event of such a disaster. They faced the physical challenge of the bleep test, and then overcame their fears to climb and/or attempt the wall. Teamwork and organisation were essential skills when searching and solving clues, as well as completing a map. The sense of achievement and satisfaction of a job well done were evident on their faces. The blue team deserve a special mention for surpassing expectations in the bleep test, and especially Michael B. for his fantastic result, and winning the overall award. 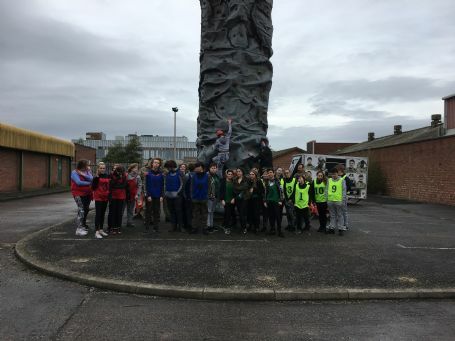 The students also learnt about the many different apprenticeships and roles available in the forces that would open up a world of travel, belonging and qualifications that could lead to an amazing career.